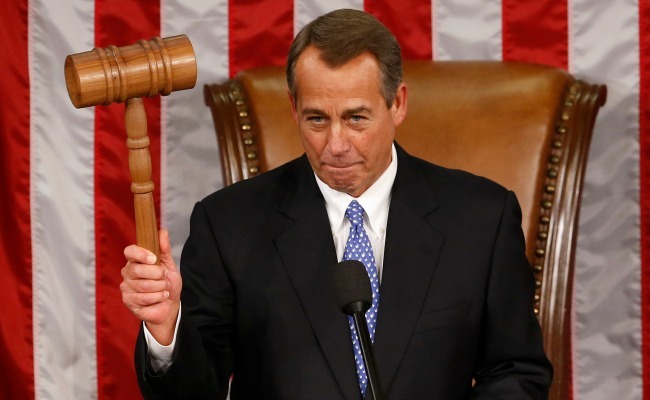 The speaker is out of ideas for dealing with his restive right wing. On Tuesday, after John Boehner’s last gambit to pass a government-funding bill ran aground in the face of a Tea Party revolt, a reporter asked the House speaker if he had any idea what he’d do next. Boehner’s dilemma -- finding a way to satisfy the right wing of his caucus that doesn’t involve shutting down the government -- isn’t new. The debate rages in Washington over whether he has an impossible job or whether he’s just terrible at it, but it doesn't really matter. Throughout it all, as Congress lurches from crisis to crisis, he has always evinced a survivor’s weary optimism that this, too, shall pass. But now he is finally, totally, out of ideas.